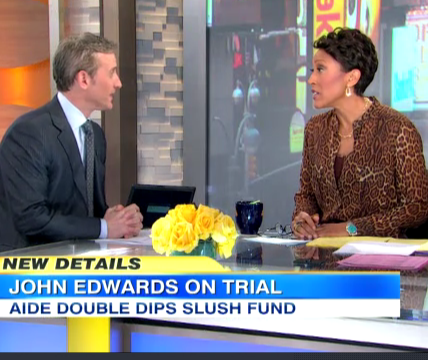 Dan Abrams appeared alongside Robin Roberts this morning to discuss yesterday’s developments in John Edwards’ trial. The cross-examination of Edwards’ former aide (which Dan has previously called very aggressive), has taken the defense in a new direction. Andrew Young has certainly proven less credible than the Prosecution would have liked. “Young is conceding that he is falsifying financial records, that he’s using some of this money to build up his own home – to build a swimming pool, etc. – that doesn’t look good!” For Andrew Young, that is. The realization at this point might be that the jurors, “who, by the way, at times weren’t paying that close attention according to some of the court room observers, after a while may be saying ‘what about John Edwards'”? Andrew Young is not the one on trial here. 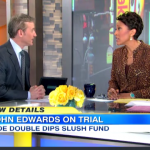 So the question remains: “Did John Edwards really not know about any of this money? The defense is saying [he] was clueless!” What remains to be seen is a more focused evaluation on that front. Watch Dan Abrams and the full discussion here.